BigSkyTool.com has Hitachi C12FDH 12″ Dual Compound Miter Saw w/ Laser Marker (Grade A Refurbished) for $196.95 – $39.39 w/ coupon code ASALE = $157.56 with free shipping. 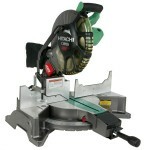 The C12FDH 12″ Dual Compound miter saw features Hitachi’s exclusive laser marker system for cutting accuracy. The saw head bevels to the right or left- allowing the material to stay securely in place for ultimate cutting efficiency. It cuts various types of wood, crown molding, plywood, decorative panels, soft fiberboard, hardboard and aluminum sashes.